50 Cent (also known as Fitty" or "Fifty") is an American rapper, actor, entrepreneur and executive producer. He was born in Queens, New York City on July 6, 1975. 50 Cent is his public name, but his birth name is Curtis Jackson. Growing up, he never knew his father and his mother died when he was just 8 years old. He grew up mostly in a neighborhood called STP. He learned how to play basketball and football. 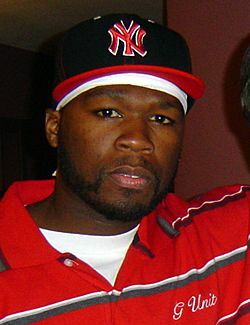 50 Cent first became successful in rap music in 2002. Since then, he has sold millions of records. 50 Cent rapped on "Monster" on Michael Jackson's 2010 album Michael. 50 Cent Facts for Kids. Kiddle Encyclopedia.